I read krystallina’s (Daiyamanga) Manga Tag post and thought this will be fun and interesting. Just like krystallina, I will add a count of how big my collection is. I’m bilingual and read in both my languages, so I will also include the German localized manga titles I own. My physical collection totals: 1349 (1244 English & 105 German; does not include pre-orders nor doujinshi/fanbooks). Just for curiosity’s sake I also calculated how many digital titles I own: 663 (621 English & 42 German; not including pre-orders). Here’s why I included my German manga because Codename: Sailor V (German) is my first manga title overall and Sailor Moon (English) is a close second. What was your most expensive manga? That’ll be the Black Bird boxed set. Even though I bought it at 50% off, but it still cost me $75. What was your least expensive manga? Least expensive title would have to be Moon & Blood Vol. 1-3 by Nao Yazawa. I bought them as a bundle for $6, which comes out to buy one get two free because retail price is $6.95 per volume. What was the most boring manga you own? Instead of boring, I’m choosing one that I have either not revisited or it didn’t leave a lasting impression. That title is Guardian Angel Getten. I honestly can’t recall the plot. What is your favorite manga series? Ooh, this is tough. I have SO many favorites. I guess I could narrow it down by genre. What is the most relatable manga series you own? Another tough one since I have so many that I relate to on some level. I’m going to list two: Girl Got Game by Shizuru Seino & W Juliet by Emura. Being mistaken for male is a constant in my life, so I relate a lot more to gender-bender titles. What is the one manga you own that is based off an anime? The Vision of Escaflowne by Katsu Aki & Princess Tutu by Art: Mizuo Shinonome Story: Ikuko Itoh/Jun-ichi Satoh. What is your rarest manga? What is the most reprinted manga you own? Probably Sailor Moon. I have Mixx, Tokyopop, Kodansha USA, and Egmont Manga (German) versions plus a few copies of the German serials. 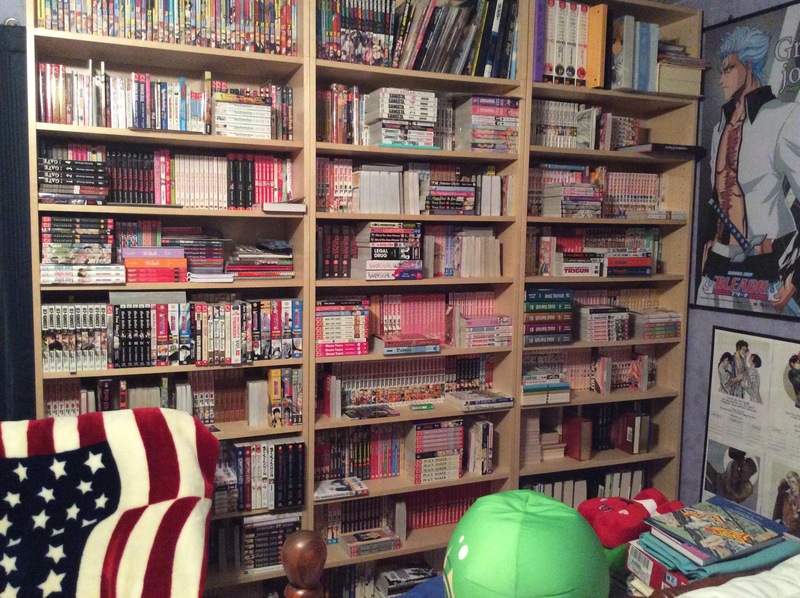 What is the most popular manga you own? Hmm… I guess Naruto and BLEACH. I haven’t gotten around to buying Attack on Titan yet. What is the most damaged manga you own? Sailor Moon vol. 2 (Tokyopop) due to water damage when a bottle of water leaked in my backpack. Seriously upset me since I like to keep my books in pristine condition. Which manga has the most amazing art? Wow! So many tough choices. If I have to choose, then it’ll be Bride of the Water God by Yoon Mi-kyung. The art is just SO pretty. I tend to get distracted by the art whenever I read a volume. What is the oldest published manga you own? Oldest published title based on original Japanese published date is Captain Ken by Osamu Tezuka (1960). What is the newest published manga you own? Newest published title based on original Japanese published date is Alice in Junk Box by QuinRose/Fujimaru Mamenosuke. What are some of the most recent manga you have purchased? Since I did just attend AnimeFest and I always come home with a good manga haul, so I bought a few titles. Fushigi Yuugi: Genbu Kaiden vol. 8-12, Gangsta. vol. 3-4 & 6, Ouran High School Host Club Vol. 13, and Phantom Thief Jeanne vol. 2-3. That was fun, so I’m tagging all of y’all reading this to also play along. ^_^ I will admit it was tough to choose favorites for some of the questions. Red River is one of those titles I regret not buying. It was just such a big commitment to make when it was releasing. Would love to have it re-released as an omnibus. I don’t remember much of Getten, but I always have a fondness for the OP and ED songs from the anime. From the title, I’m guessing you have the original Raijin versions? And some good recent purchases! Red River is a fav that won me over from just reading ch1 at Borders. I would totally buy the omnibus release because it’s that good of a series. I wish more of Chie Shinohara’s series were picked up, but all her series are “old” and 10+ volumes long. Thanks! Needed to fill gaps. I picked up the Raijin versions but dumped them for the Tokyopop ones. They’re sitting on my shelves…somewhere. It’s too bad so many old titles aren’t getting picked up or rereleased… Especially since some have sequels (like W Juliet II and Boku-Tsuki). I’d love to add W Juliet II and Boku-Tsuki to my collection. If only newer manga fans would venture out of their box and explore more than just the popular mainstream ones.